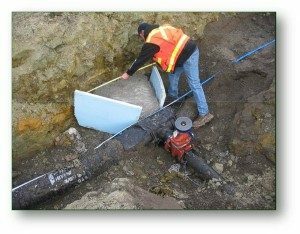 Every utility contractor deals with the thrust block money pit – Because – size matters. You would think that a small dollop of wet concrete would be a simple deal – Right? Well, the fact is that trust blocking is a hassle at every turn, and in every project the size matters in reducing thrust control costs. The small amount of concrete needed, combined with delivery issues, create a battle between you and your concrete supplier. At the center of this battle is one cubic yard of concrete that the city specified for thrust control on the pipeline. On your side, there is an open ditch and you want concrete now, and on the other side is the ready-mix guy who wants your project as a clean-up load, and at the end of the day. The partial compromise between sides is called a “short-load” charge – But you get to pay for it. Unfortunately, this extra fee is only a small part of the money pit called a thrust block – The cost to payroll is where it really hurts your bottom line, with guys standing around waiting for a concrete delivery. Again, size sometimes helps if you do enough business with the concrete supplier to demand a delivery on your schedule. But in most cases they control the delivery schedule and so you must live with the open ditch, the people standing around and the extra delivery charges. If you have a large job with multiple lines working you might be able to combine your thrust block needs and garner a full-truck delivery. These full loads are what ready-mix companies like, so your scheduling hassles will reduce. Most of the time, it is just one or two blocks that are needed, and you must pay the fees to keep the job moving on schedule. 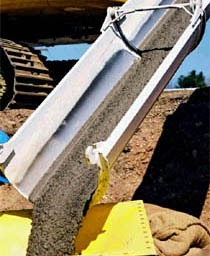 If size is not on your side, then the solution is to control the concrete delivery schedule yourself. Unfortunately owning a ready-mix plant and trucks is not practical for most contractors, so maybe a smaller mixer might be the answer. 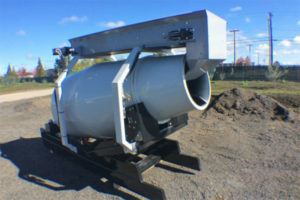 For the past 20-years, utility contractors have opted for a mid-sized concrete mixer to fill their thrust block concrete needs. 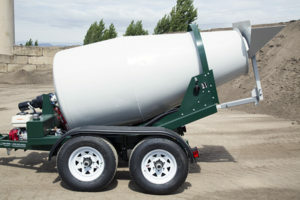 In some communities, this 1-yard and 1.75-cubic yard mixing trailers can be rented, but most contractors have found ownership is the best route. Even with a full load of concrete, these small mixers don’t weigh much. They roll down the road under 10,000lbs and can be towed behind almost every truck in your fleet. 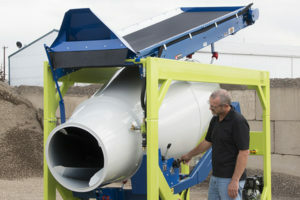 Mixing trailers work just like a ready-mix delivery truck except they also tilt down to dump the mix directly into your forms, and are much easier to clean. Over the years pouring thrust blocks has become the number one use for these small concrete delivery trailers. There are thousands of these trailers on the road every day and combined they have mixed over a million yards of concrete. In fact, several contractors have working fleets of these mid-sized mixers and they work them at various locations simultaneously. When the humble thrust block is Causing you big hassles and reducing your profits, you might remember that size does matter. 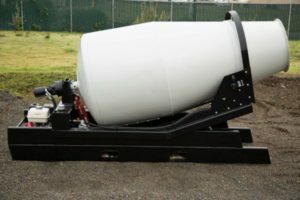 When thrust control is on the plans, plan on delivering your own concrete and take size out of the equation with a mid-size concrete mixing trailer.